Enjoy a day of curated wine tasting and visit boutique wineries and vineyards on this full-day, small-group tour that includes tastings, cheese, and lunch. See how wine is made in the Swan Valley and meet owners, winemakers, and sommeliers and tour their facilities and vines. 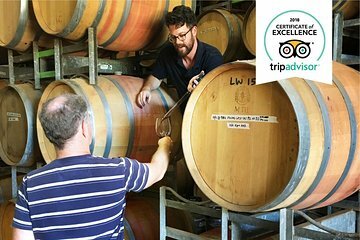 Sip reserve and fortified wines and snack on expertly paired foods in Australia’s oldest wine region. My husband and I had a great day out on this tour. Paul was a terrific guide. We started off at Olive Farm Wines where we had a very interesting wine tour followed by wine tasting. Then it was lunch next door and we enjoyed a delicious platter and a glass of wine. More wineries and chocolate tastings followed at other venues. We had time up our sleeves so Paul took us to Kings Park - something we wanted to see in Perth but didnt schedule. The small group tour was personalised and I highly recommend this tour and the company.